One of the most powerful things that you can do on your journey of self-development, manifestation, and or recovery is transform your relationship with sleep. I was born this way. Sleepless. Restless. I have had trouble sleeping from the get-go. As a child I thought naps were punishment and that I was going to miss all the fun if I slept while others stayed up. #sorrymom In my twenties I thought sleep was for the weak. "I'll sleep when I'm dead," was my motto and in all honesty, it almost killed me. I didn't realize that my lack of sleep was robbing me of my health and sanity. Fast forward to now. I'm still on a journey of transforming my relationship with sleep. When the rest of the world settles into the quiet of the evening, my brain kicks into high gear with buzzing creative ideas for hours. To this day I still want to stay up till 2am and not let go of the day. It's like darkness ushers in an anxiety and urgency of all there is left to DO! But here's what I can share about what I have learned thus far and the practices that have helped me along the way. 1. Understand what sleep is and what it isn't. Sleep isn't wasted time. I used to think it was just an annoying biological necessity. A glitch in our program. 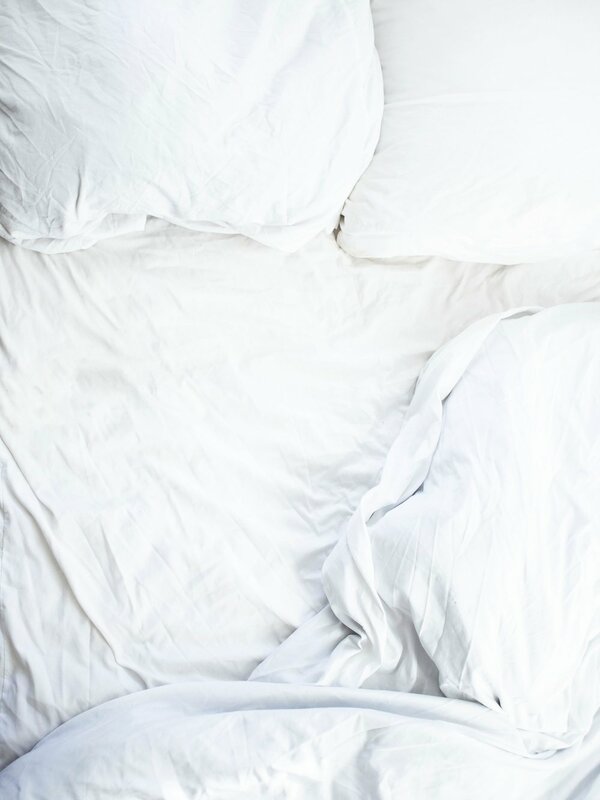 Why do we have to waste 1/3 of our lives in bed unconscious? I didn't realize that's not what's happening. Sleep is a vital time to both our conscious and subconscious mind as well as healing and restorative time to our bodies. Much of the 'housekeeping' so to speak, happens without our participation. Our physical body goes to work restoring cells, processing toxins, turns off our muscles for the purpose of re-building muscle tissue and so much more. Our brain takes the 'files' from today and stores them in long term storage. It takes the events of the day and stores them in the 'filing cabinet' that it decides is most appropriate. Overnight it also sweeps out old, unused synaptic connections. Our subconscious mind takes those mental files and makes meaning from them. It writes the script that you live out on a day to day basis. Another thing to note is that the swirling energy of emotion you have each day settles back to neutral. The dust settles, the train goes back to the station, the tide recedes. The physical act of sleep allows us the full power down that we need to reset our emotions so that we can each day, choose how you want to feel from a blank slate. As you enter into and come out of sleep your brain goes through various brain wave states. That liminal space between being awake and asleep? That's when your brain is in a theta brain wave state. Not so coincidentally theta is also the relaxed brain wave state associated with meditation. It is In this state you're brain isn't focused on one thing, it's open and able to float between dreams and ideas, making connections that you wouldn't happen upon in a focused waking state. Theta is the place that dreams are made. Your subconscious and conscious mind are more connected in this state. You naturally flow through this brain wave state twice a day even if you're not a meditator. Knowing this and understanding how to put these times to use can be incredibly powerful for the way you create your life. There is a ton of literature that details the reasons to banish technology from your bedroom, and I have to say that it has helped me tremendously. With one caveat... see number 4. Getting into the habit of having a nighttime ritual can be incredibly helpful to switch from daytime 'on' mode to an easier time getting to sleep. This signals your body to come down from the energy of the day. a) make an evening playlist of songs that take you down a notch into relaxation. c) make a ritual out of making your favorite drink before bed... hot tea, water... anything without caffeine or that's low in sugar. d) find a face wash or lotion that you truly love that you only use before bed to make it special. This may sound like a silly detail, but it has helped me look forward to my nightly ablutions. e) finally, instead of a book, read on for some mental focus points to help set your focus and intentions before you drift into the fertile brain waves of sleep. If you're anything like me and have a buzzing brain and resistance to sleep, these can work wonders to help you downshift into a more comfortable time going to bed. This one takes some time to kick in, so keep reading for a few other things to help make this process even more enjoyable. Right before sleep and right as you're waking are such powerful times for communication with your subconscious mind that I suggest being cautious to use it wisely. Ever heard the old adage "Don't go to sleep angry"? It's truly wise when you think about it from this point of view. Knowing that you go through a highly suggestible phase on the way in and out of sleep allows you to capitalize on it. a) Gratitude. There's a reason why this is first and foremost by many experts. Gratitude is on the opposite side of the spectrum from negative emotions. If you are drawing yourself towards the higher end of the scale, the lower feelings of frustration, anxiety, anger, or fear, tend to fall away because you have crowded them out. Fill your heart and soul with the things you are so glad you have that you'll be asleep before you have time to focus on the other stuff. And gratitude begets more gratitude. Watch it multiply! b) What progress did you make today? However large or small focus on the progress you made towards being the person you want to be or achieving the goals you set out to achieve? Humans derive joy through progress. Focusing on what progress you have made and feeling good about it helps to build positive momentum. This shifts the focus from "how far yet to go" to "look how far I've come!". It's shocking just how that little shift can help you keep going when you might otherwise give up on actually seeing that dream or goal through. c) See the end, now. What dream do you hold dear? What vision are you trying to bring into reality? Picture it as already having happened. Drift into sleep using this as your focus. This is like miracle grow for your dreams. This imprints on your subconscious mind what the reality looks like of your ideal future. Doing so in a present focus, with positivity can supercharge your vision. d) Record yourself on your voice recorder speaking about your big vision. Listen to this as you drift into sleep. This time is so ripe for planting your dreams. If, like me, there are times that you have trouble focusing your mind on your vision in silence, listening to a prerecorded walk through can work wonders to help turn off your day to day worries. You can do this with a dream you want to move towards or fill up a voice memo with all the things in life that you're so grateful for your heart could explode with love. 5. Go analog. I keep a journal and pencil by my bed to jot down things that come to me in my liminal state between waking and dreams. I find that random words come to mind that can be incredibly useful to me throughout my day. They feel like little breadcrumbs from my intuition or higher self. And when I am waking I scribble down the trails of those dreams that fade so quickly in the sunlight. I hope these help you as much as they have helped me. Sweet dreams, dear ones. Sweet dreams.